The pattern seems to be repeating for the last few days with Nifty opening flat to positive, making the highs within the first few minutes and then a slow grinding selloff towards the previous days close value. Nifty today made high around 6743 but closed just positive at 6715.30, gain of 15.95 points. The broader market though was negative, with 730 advances to 759 declines. Expected range till before Election result seems to be 6500-7000. 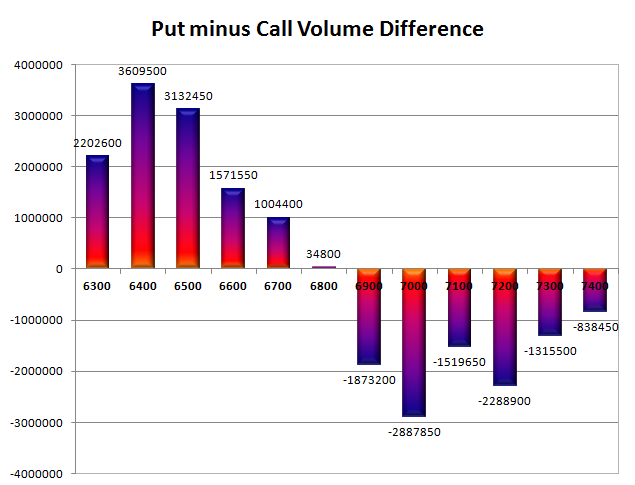 Call option 6900, 7100-7300 added 9.61 lacs huge amount of OI with profit booking seen at 6800 and 7000 strike prices. Put option 6700-6300 added 8.56 lacs huge amount of OI with short covering seen at 6800 strike price. Nifty Open Interest is at 1,29,06,650 down by 2,45,750, with small increase in price, most probably long liquidation. 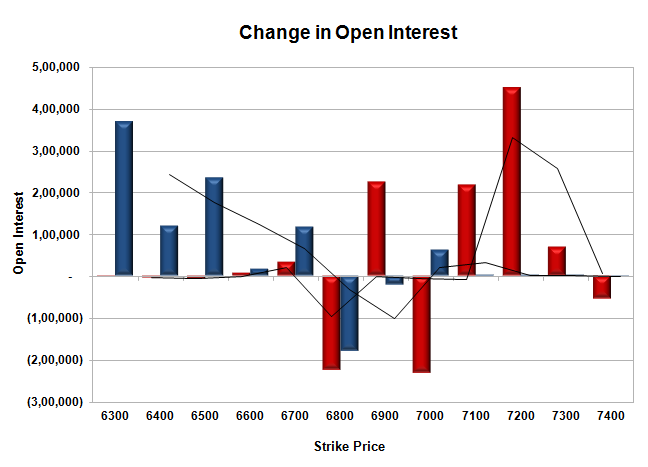 Bank Nifty Open Interest is at 16,61,225 up by 76,925, with increase in price, most probably long build-up. FII’s sold huge 6.57 lacs Futures, mostly long liquidation as their net OI decreased by 7089 contracts (includes 23539 longs to 36678 shorts for the day) and the average price per contract comes to around 6710.63. FII’s future open contract as on date is 259298. PCR Open Interest (Volume) is at 1.129. 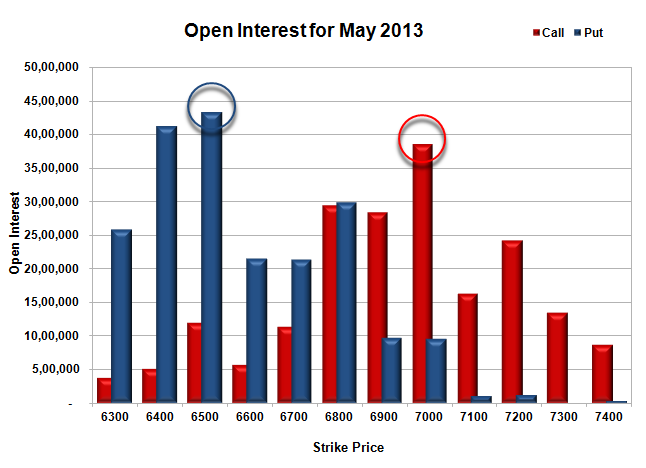 Initial support still at 6700, with OI of 21.38 lacs and below that at 6500 with highest OI of 43.34 lacs. Initial resistance at 6800 with OI of 29.47 lacs and above that at 7000 with huge OI of 38.47 lacs. Day Range as per Option Table is 6671 - 6771 and as per VIX is 6598 - 6832 with 6720 as the Pivot.